This weekend, I got news that Ally Condie, author of Matched, was signing at a local bookstore. She lives nearby (ish), and had her launch party in my town, but I missed it because I was sick, so I was determined to go meet her and get a signed copy of Matched. The Kiddo came with me since the hubs was at work, and when we got to the store I almost turned back. Okay, not really, but it was PACKED. They were having a Ladies Night, and I had to fight my way to the signing table. It was worth it, though. I had a lovely little chat with Ally, got my signed book, and got a picture with her. I'd been lucky enough to read an ARC of Matched, but I'm glad to have my own copy now-- and signed! It reminds me of The Giver in some ways, which is my favorite dystopian of all time. Here's my review, though I've decided to do something a little different with my reviews. I want to focus on things I learned from the books as a writer, and to pass them on! Here's the blurb from Amazon: "Cassia Reyes is a model student, daughter, and citizen. How could she not be when the Society has everything planned and functioning perfectly? All of her needs are met: food, shelter, education, career training, and even her future husband are selected by officials who know what is best for each individual by studying statistical data and probable odds. She even knows when she will die, on her 80th birthday, just as the Society dictates. At her Match Banquet she is paired with Xander, her best friend and certainly her soul mate. But when a computer error shows her the face of Ky, an Aberration, instead of Xander, cracks begin to appear in the Society's facade of perfection. A series of events also shakes her dedication to Xander and puts her future in jeopardy." The story is a little slower than I first anticipated, but that doesn't mean it isn't a gripping read. Both times I've read it, I finished it in a single day. I love the characters, especially Xander and Ky, and I love that the love triangle actually MAKES SENSE. I didn't spend the book going, "She's so stupid, why can't she just make up her mind!" I was torn between the boys too. As a writer, the biggest thing I learned from Matched is that your actual WRITING counts! I've read some books lately where the plot was interesting, the characters fun, and the writing clean, but they didn't have that...oomph to their prose. I loved Matched in part because of the gorgeous prose. It was all the more engaging because of the lyrical rhythms that came out as Cassia's voice. This isn't to say all your writing needs to be lyrical and poetic. Your character's voice-- and your own authorial voice-- might not be like that, and that's fine! But when you put your words together and string them into sentences, try to find a way to make them flow however the story dictates. One thing that helps me immensely is to read poetry-- and lots of different poets. It helps to get a feel of how I can use words in different ways to create different moods, voices, and rhythms. So don't forget your prose! 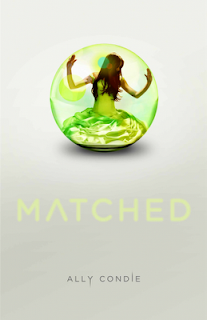 So, my friends, have you read Matched? What were your thoughts? Do you try to focus on your prose at some point when you're writing? What tips can you share with the rest of us? I LOVED Matched. I was lucky to get an ARC as well! I loved it so much I bought the hardcover. I was going to go on Saturday to get my book signed, but sick kiddos kind of get in the way. :( I heard she is going to be signing in Logan in a few weeks with Shannon Hale, Jessica Day George, Brandon Mull and James Dashner though. I'm totally going to that one! How exciting! It's fun to meet the person who wrote a book you enjoyed! I also liked/appreciated how you did your review. You're comments make me want to read Matched just to see how she writes! I won a copy and really enjoyed it too. I read it on a road trip and every time we stopped for gas or food, I looked around for government agents or to see if books/music/poems were the 100 we are forced, um, the book mentions. Been a little time since I came by. You know, I've never thought about reading Poetry as a way to better my prose, but I can see how that would help. Haven't read the book, but it sounds interesting. I've heard of Matched, but haven't read it. I think you're so right about our prose. I try to give mine some thought, but I have no tips. It comes and goes. The more I write, the more the caring about it seems to stick around. Maybe that's all part of finding our voices. I haven't read it but your honest review has made me want to pick it up. Thank you!